A tri-shutter .cut file and a pop-up card cut file! I got both of the .cut files done but I don't want to post them until I get them tweaked and make sure they work okay. I did get the tri-shutter cut tonight and stickles are drying so it will be tomorrow before I post the pictures and such. 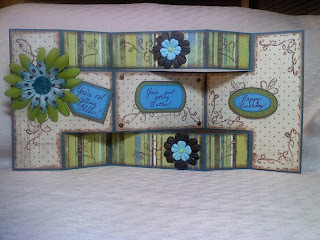 I am hoping to get the pop-up card cut tomorrow and get it posted also. Here is the tri-shutter card I made. I will have instructions for it tomorrow, along with the cut file. That is AWESOME! I love the colors. Can't wait to see the .cut file. This turned out beautiful. I love the colors you chose. Can't wait till you get the cut file up so you can share with all of us. Hope you have a wonderful day! Very cute........but not very masculine if it's for Wayne's b-day! Don't know what happened to my ID and password but have to post this Anon! wow you are one talented lady!! Cute card, love the paper. It's wonderful to see your creations coming out again!! Love the colors! I've gotta make me one of these!